Do you want to stay connected with latest news updates from your favorite sources? Would you like to receive feed alerts and updates via instant messenger or over SMS? If the answer is yes to either of those questions you might want to read further as a few new services have popped up recently that might make it possible to get feed alerts anywhere. FeedCrier is a new service created by Adam Kalsey, founder and former CTO of Pheedo. 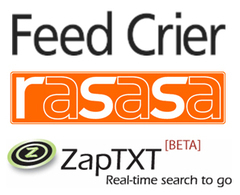 FeedCrier offers the ability to deliver feed alerts or updates via AOL Instant Messenger. Rick Klau of FeedBurner was the first to draw my attention to FeedCrier. Interestingly, Rick created a piece of FeedFlare to be added to the bottom of a feed. In case you do not recall what FeedFlare is, check here for refresher. The FeedFlare places a link at the bottom of your feed which offers you the ability to opt-in to FeedCrier instant messenger alerts. Rick has placed the FeedCrier FeedFlare here if you are interested in giving it a try. "These other services are not limited to AIM, they offer autodiscovery bookmarklets and both ZapTXT and Rasasa incorporate SMS and email alerts as well. Rasasa’s push technology is the smartest, but isn’t supported by all US mobile vendors." Read/Write Web wrote a piece on ZapTXT, sizing it up as a possible replacement for the keyword search product PubSub which recently folded. While all products mentioned are innovative and pushing RSS feeds and syndication to new limits, the ability to not only instant messaging updates but also SMS alerts for on the go updates positions ZapTXT and Rasasa as slightly more appealing options.